Headwaters’ Amenity Center, HW Central, officially opened on July 22nd! The approximately 650 people who attended the Grand Opening were among the first to tour our newly completed amenities and experience what life at Headwaters is like. At what is sure to be the first of many exciting events to happen at HW Central, visitors enjoyed food, festivities and fun. Kids had a blast with lawn games, face painting, caricature and balloon art, while the adults loved the complimentary tastings from Twisted X Brewing Co., Frost 321, Greater Goods Coffee and Texas Hill Country Olive Company. Four lucky attendees won prizes, ranging from YETI coolers to oversized gift baskets. Then families wrapped up the afternoon with a catered BBQ lunch from Railroad Bar-B-Que and deliciously sweet treats from Kona Ice. As they explored the amenity center, attendees enjoyed live music and discovered the many event spaces, comfortable lounge areas and gorgeous views. Within HW Central, visitors were able to check out the state-of-the-art equipment available in HW Fit, including Cybex Fitness Equipment, Expresso cycling bikes and Wellbeats™ virtual fitness classes accessible on demand. They also learned more about the year-round calendar of lifestyle programs offered at Headwaters, including running groups, coffee socials and stargazing groups, as well as seasonal events planned by Headwaters’ full-time Lifestyle Director. After refueling with some cold brew coffee from Greater Goods Coffee and snacks from the local favorite, Rolling in Thyme & Dough at the HUB Wi-Fi café, attendees toured the resort-style split-level pool complete with waterfall and splash pad. Here, visitors enjoyed the panoramic hill country views and shaded pool-side lounge areas. At the beautifully manicured playfield, kids played lawn games and everyone enjoyed the amazing performances by the dogs of PAWS Shelter of Central Texas, which is opening a new shelter nearby in Dripping Springs. Just a little way down the trails, families explored Homestead Park where future residents will spend their days picnicking, playing croquet and gazing at the night sky in the one-of-a-kind stargazing amphitheater. 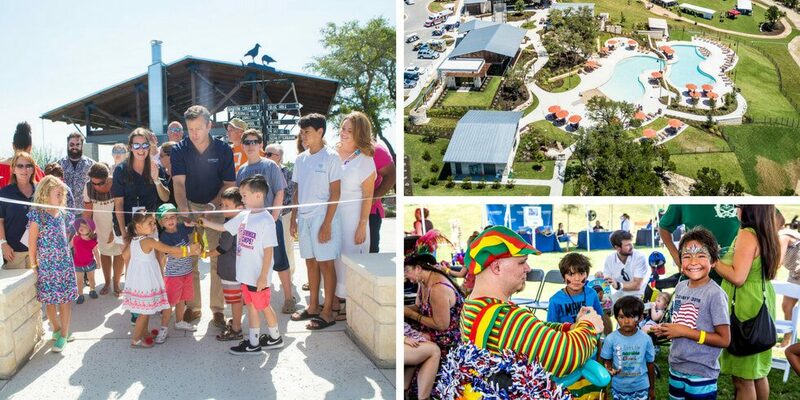 If you missed the Grand Opening, it’s not too late to see Headwaters for yourself! Stop by for a tour of the amenities and model homes any day of the week, no appointment needed. Make sure to join the Founders Club to always stay up-to-date on Headwaters’ happenings and receive invites to future events.